The Vivian Morris Music Award for 2018 was presented to two outstanding students from Gillotts School at the final school assembly. The head of the music department nominated Madeleine Bourne and Ella Davies for the award which is given in the name of one of the founder members of the Lions Club of Henley-on-Thames. The nomination attests to the fact that both girls thoroughly deserved to be recognised. 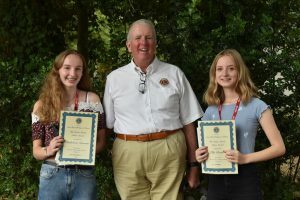 The nomination stated “Maddie and Ella were the Music Captains whilst they were in Year 11. They also took Music at GCSE. They were incredibly helpful in Choir, guiding and leading the younger years and setting a good example to them. They also showed their own wonderful talents through singing a number of duets over the year, most notably starting the whole of our Carol Service at St Mary’s Church in December 2017 and singing a duet alongside a dance piece in the Gillotts Spectacular. I have chosen them for this award for their commitment to Music over the past two years and for all of the positive and lovely conversations we had!’ Each of the girls received a certificate and a cheque in the amount of £100. This was the 13th year that the award was presented to Gillotts students.